Indian manufacturers of electric bikes, or e-bikes, are gearing up for what they call a second wave of growth for these “plug and ply" bikes. They say they are on the verge of launching faster versions of their bikes and this would blunt the edge of traditional two-wheeler bikes in the country. Electric bikes operate on a chargeable battery and do not require petrol to operate. All the e-bikes today do not require registration or licence. This means they have to follow certain statutory norms that specify that the speed of such two-wheelers should not be more than 25kmph. “We are now all set to launch a new e-bike—Yo Speed—that would have an engine of 750 watts, compared with 250 watt engines that existing e-bikes have. It would require registration and licence to ride and the average speed would be 35-40 kmph. This would help explode the demand for e-bikes in India," says Avinash Bhandari, director of Ahmedabad-based Electrotherm (India) Ltd, which sells e-bikes under the Yo Bykes brand. “The real game would begin when we launch our high powered engine e-bike to compete with TVS Scooty Pep+ and Honda Activa." Citing the reason for the new models, Bhandari said that potential buyers were apprehensive as they believed that a scooter has to look like a scooter and must carry more weight at higher speeds. “To a common user, performance and affordability is important. It does not matter what fuel is being used or no fuel is being used," he added. The new vehicle from Electrotherm would be available at a discount of 5-10% compared with the petrol vehicles and would run 500km on Rs50 worth of electricity. “If you add another Rs7,500 for battery replacement after 20,000-25,000km, the operational cost of this road would be around 40 paise per kilometre. This is much less than petrol version," says Bhandari, adding the running costs could help boost sales. Electrotherm entered the e-bike business in 2005 with a manufacturing plant in Kutch district of Gujarat. It has a capacity to make 100,000 e-bikes every year. In the first year of production, Electrotherm sold about 28,000 e-bikes and has sold 35,000 e-bikes so far this year. Ganesh Mahalingam, managing director of Ultra Motors Co., another entity that manufactures e-bike in joint venture with Hero Electric of Hero Cycles group, says that they too are working on a faster electric vehicle that would have a speed of about 50-70kmph. “It would take us six more months but remember that the electric bike market has come of age only in last six months as, unlike in the west where e-bike is a lifestyle product and for some an environmentfriendly technology, in India it is an economical mode of transportation. 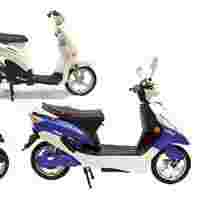 Primarily it is an aam admi (common man) vehicle as it is 10 times cheaper to operate an electric two-wheeler that the traditional petrol bike," Mahalingam said. Hero Cycles Ltd, like Electrotherm, launched its range of Hero electric ultra-powered electric two-wheelers in seven variants of e-bikes and e-scooters branded as Hero Electric and priced between Rs14,300 and Rs19,000. The e-scooters are in the range of Rs22,000-28,000. With no organized body to represent these manufacturers, industry players guess that there are between 75 and 80 players manufacturing e-bikes in India. The growth in the demand has also pulled in smaller players, such as Bakul Patel and Jayesh Patel from a remote town of Bhavnagar in Saurashtra region of Gujarat to launch their variant of the e-bike. They have branded it Princy and have opened their showrooms in localities dominated by lower-income and middle-income groups in Ahmedabad. And, unlike most of the e-bike players who have opted for Chinese technology for their vehicle, the makers of Princy have opted for Korean technology. “We thought that we would sell 2,500 vehicles by Diwali but in the first couple of months of our launch we have already done 4,000 vehicles," says a company spokesperson. Still, key hurdles remain for the e-bike industry. One of the major issues is that many small players are flooding the markets with a product that doesn’t meet statutory requirements. “They are not supposed to have a speed of over 25kmph, but many do as they use a motor of higher capacity. Some of them launch their vehicle and also give warranty but do not have adequate dealer or service network. They also do not have spare parts. All this creates a very negative image in the minds of people and can badly affect the growth of this industry in the medium and long run," claims Bhandari. Mahalingam also shares this view but says he would rather focus his energy on expanding the business and growing the sector. “Today, I sell around 3,000 e-bikes per month and Yo Bykes sell almost the same number of e-bikes. We have a brand name to protect and we comply with all the statutory norms. We have no intent of stopping them or fighting against such fly-by-night operators who flout these norms. We would rather focus on growing our business and hope that cops would stop them somehow," he said. Both Electrotherm and Ultra are hoping that the creation of a strong dealer network and service support will help make a dent in the conventional two-wheeler market. Electrotherm has set 58 dealers, while Hero has 50 dealers across the country to sell and service their vehicles. “I feel that only national players would survive. All those who have done investment in equipment and service would not have any trouble growing," says Mahalingam whose firm is targeting revenues of Rs150 crore by March. Electrotherm’s Bhandari expects that the industry will sell 150,000-200,000 e-bikes annually with his firm selling at least two-thirds of that for revenues of atleast Rs250 crore, compared with Rs69 crore it earned last fiscal year from Yo Bykes. Bhandari believes that over the next five years some e-bike companies will see 100% growth in sales.